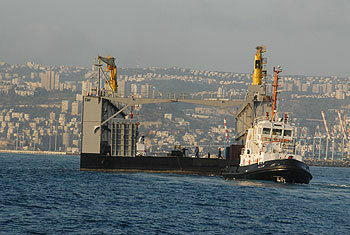 Israel Shipyards supplies floating docks for both naval and marine operations. Due to growing demand to establish more shipyards and ship-to-shore services, floating docks of varying sizes are fast becoming a popular request. ISL floating docks are currently in service in shipyards not only along Israel's long coast, but also in Greece, Italy, Philippines, Turkey and Equatorial Guinea. These custom-tailored docks are designed for reliability, heavy tonnage support and fast deployment. As mobile structures, they can be moved to different locations. Lift capacity of 4500 tons, 7500 tons and 20,000 tons. Suitable for maintenance and repair of a wide range of vessels, from patrol boats to merchant ships. Docks are fitted with all systems needed for independent docking and maintenance activities. Operation is simple and requires only a Dock Master and a limited team.